I’m loving the Jeremy Lin story. Been following it closely for the past week. I’m a bit of sports junkie, and had actually heard of Lin before this week. So no surprise I was in on this story from the beginning. Since Wednesday, I’ve been asking my wife: “Heard of Jeremy Lin, yet?” I’m interested to hear when the Linsanity story crosses the threshold of the sports ghetto, and goes mainstream. My wife hearing about it will represent when that theshold has been crossed. And trust me, Linsanity goes well beyond basketball. Well beyond sports, generally. Well beyond the place of Asians in our American culture. Exactly. But it’s more than just about the triumph of the underdog. No, the Linsanity story is about the incredible and sudden melting of monolithic hierarchies, in real time, right before our very eyes. “And a child shall lead them,” somebody once wrote. Which brings me to OWS. I’ve blogged about how OWS is a reaction of the People to the monolithic hierarchies that dominate our nation, and puts lie to the notion that our nation is an efficient meritocracy. Among the 3 major American professional sports, basketball is the one that most resembles our current culture. A culture in which Mitt Romney can offer a $10,000 bet and have no clue what that means for the rest of us. In basketball, a small handful of players makes most of the money, and gets almost all of the accolades. And once you’re in, you’re in for life. Stardom in the NBA is a rigid monolith. The hierarchy is endemic. Basketball example: Last year, Dirk Nowitzki was the Jesus Christian savior of sports. Like a knight of mythology, he slew the dragon of evil from Miami in the playoffs. We watched in amazement and joy last June as these magical things came to pass. This December, when the NBA restarted after a lengthy lockout, Dirk showed up fat and out shape. For the first two months of the season, Dirk flat out sucked. But Dirk doesn’t define the monolithic hierarchy that is the NBA. It’s way beyond him. So he goes to the all-star game. That everybody who watches and plays in the NBA understands this monolithic quality is shown by how the stars of the league are slowly migrating to play on the same teams, in big cities. It is in the face of this seemingly impenetrable and irresistible monolithic hierarchy that is the NBA, that Linsanity emerges. Like a harbinger of truth. A rapier of our fears. Linsanity, coming in this first week of February of 2012, in the depth of this winter of our discontent, is a sign of hope for the children of OWS. It is an early sign of Spring. 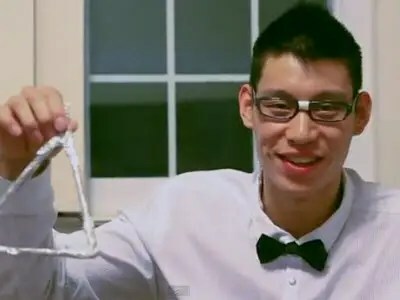 If Jeremy Lin can do this to the NBA, you OWS children can do this to our enslaved nation. OK. So I’m probably the only person in America drawing these threads from Linsanity. But I will say that something weird happened last night. On the ESPN website, every night, there is a moderated chat room called “Daily Dime Live” (DDL). The participants in DDL chat about the games currently going on. As one game ends, and another starts, they shift their discussion to the new game. But last night, after Jeremy slew the Lakers, the DDL got stuck. The kids couldn’t get Lin out their minds. Like a collective episode of ADHD, the kids could not shift their attention to the next game. It was endless. It went on for hours. Something in the firmament shifted last night. Yeah, it was only a sports game. In a sport of declining popularity, no less. But it was a sign. It was an omen. A promise of better days to come. God bless America (even if God doesn’t exist). 4 Responses to "Linsanity, OWS, and Universal Redemption"
I saw the game last night too. Great game. I love the story because it is the triumph of the underdog. As I watched, I wasn’t cheering for the Knicks, I was rooting for Lin. And did you see his interviews that followed? Humble would be an understatement. I love watching humility in the face of greatness. Derrick Rose anyone? As far as the melting of the monolithic hierarchies goes, it won’t happen in my life time nor my children’s. For that to happen, society as a whole, with their thoughts and actions (including financial actions), must value the environment, human connection, humility and quality of life for all people, more than they value power, control, entertainment and money. Thanks. Actually, this goes well beyond humilty. In his postgame interviews, Lin profusely credited teammate Jared Jeffries and Coach D’Antoni. Those two figures received some of the harshest criticism for the Knick struggles this year. For Lin to say the things about these guys that he has said in his “moment of glory” goes well beyond humilty. But he’s only 22 or so. With someone that young, I tend to think I’m hearing more about his parents than him. I believe the same when I read negative stories about young people. So I didn’t find that part so interesting analytically — even though it’s probably the most heart-warming part of the story. I’m typing this on my phone. So I’ll keep this short. I’m going to blog about the long held assumptions about the NBA, seemingly set in stone, that Lin, with the passionate help of his teammates, has destroyed this week. I expect something similar with OWS this Spring.